Ectropion is the medical term used to describe an abnormal lower eyelid that turns outward and no longer touches the eye. As a result, the conjunctiva (the mucous membrane that lines the eyelid) may become red and exposed. This condition usually involves one or both lower eyelids but rarely affects the upper eyelid(s). What are the causes of Ectropion? Ectropion is usually a result of aging and occurs when the tissues of the eyelid develop laxity. Thus, this condition is most often seen in elderly people who develop stretching of the structures supporting the lower eyelid. It can also arise as a result of undetected skin cancers pulling down the eyelid, trauma, contraction of scar tissue involving the skin surrounding the lower eyelid, and following eyelid or facial surgery. Ectropion may also develop following facial nerve palsy (Bells Palsy), in which the muscles surrounding the eye (and other facial muscles on the side of the face) are paralyzed. Finally, Ectropion may be further aggravated due to constant wiping of excessive tearing, which tends to pull the eyelid further from the eye. Myasthenia Gravis Ectropion can cause chronic irritation to the eyelid and the eye. This can result in excessive tearing, crusting of the eyelid and mucus discharge, infection, irritation of the cornea (the front part of the eye), and impaired vision. Exposed Inner Lining When the lower eyelid is turned outward and no longer touches the eye, it cannot properly spread the tear film across the eye. This leads to poor drainage of tears through the nasolacrimal (tear drainage) system. The exposed inner lining of the eyelid becomes dry and inflamed. As a result, the eye may become damaged. How can Ectropion be treated? Ectropion prevents the tear film from properly lubricating the eye. To treat dryness, artificial tears and lubricating ointments may be used to keep the cornea moistened. A protective shield may be worn at night to keep the moisture in the eye as well. If your Ectropion is caused by weakened supporting structures in the eyelid, the condition is best treated surgically. 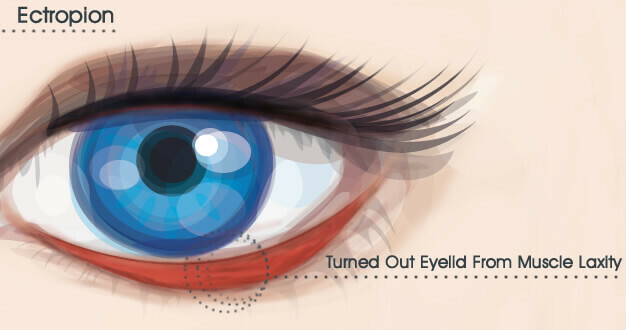 Depending on the cause, surgery can shift the eyelid back to its normal position against the eye. Ectropion surgery is usually performed on an outpatient basis using a local anesthetic. If the Ectropion is a result of scaring, skin cancer, trauma, facial nerve palsy, or some other factor, treatment of the underlying condition may be done before or at the same time that the Ectropion is repaired. Is Ectropion Repair right for me? At Miami Eye Center, Dr. Joseph Selem will meet with you during your private consultation to assess your individual situation. Dr. Selem can help you decide if Ectropion Repair in Miami is right for you. See the beauty in yourself and the world around you in crisp, clear detail today! Request an appointment online or call Dr. Joseph Selem and the staff at Miami Eye Center at 305-444-0221 to schedule your private consultation.